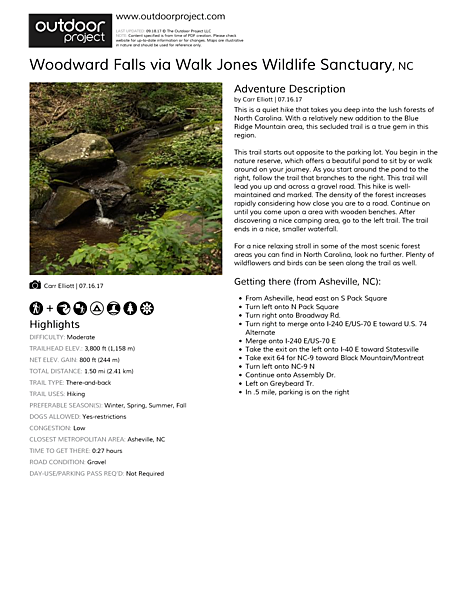 This is a quiet hike that takes you deep into the lush forests of North Carolina. With a relatively new addition to the Blue Ridge Mountain area, this secluded trail is a true gem in this region. This trail starts out opposite to the parking lot. You begin in the nature reserve, which offers a beautiful pond to sit by or walk around on your journey. As you start around the pond to the right, follow the trail that branches to the right. This trail will lead you up and across a gravel road. This hike is well-maintained and marked. The density of the forest increases rapidly considering how close you are to a road. Continue on until you come upon a area with wooden benches. After discovering a nice camping area, go to the left trail. The trail ends in a nice, smaller waterfall. For a nice relaxing stroll in some of the most scenic forest areas you can find in North Carolina, look no further. Plenty of wildflowers and birds can be seen along the trail as well.